After the Ascension of the Lord, the Mother of God remained in the care of the Apostle John the Theologian, and during his journeys She lived at the home of his parents, near the Mount of Olives. She was a source of consolation and edification both for the Apostles and for all the believers. She told them about miraculous events: the Annunciation, the seedless and undefiled Conception of Christ born of Her, about His early childhood, and about His earthly life. Like the Apostles, She helped plant and strengthen the Christian Church by Her presence, Her discourse and Her prayers. The reverence of the Apostles for the Most Holy Virgin was extraordinary. After the receiving of the Holy Spirit on the day of Pentecost, the Apostles remained at Jerusalem for about ten years attending to the salvation of the Jews, and wanting to see the Mother of God and hear Her holy words. Many of the newly-enlightened in the Faith even came from faraway lands to Jerusalem, to see and to hear the All-Pure Mother of God. The respect of Christians for the Mother of God was so great that they preserved what they could about Her life, what they could take note of concerning Her sayings and deeds, and they even passed down to us a description of Her outward appearance. When did She ever hurl the least insult in the face of Her parents? When was She at discord with Her kin? When did She ever puff up with pride before a modest person, or laugh at the weak, or shun the destitute? With Her there was nothing of glaring eyes, nothing of unseemly words, nor of improper conduct. She was modest in the movement of Her body, Her step was quiet, and Her voice straightforward; so that Her face was an expression of soul. She was the personification of purity. 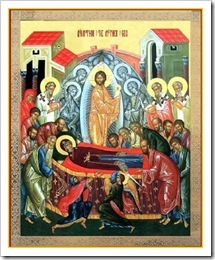 The circumstances of the Dormition of the Mother of God were known in the Orthodox Church from apostolic times. In the first century, Hieromartyr Dionysius the Areopagite wrote about Her “Falling-Asleep.” In the second century, the account of the bodily ascent of the Most Holy Virgin Mary to Heaven is found in the works of Meliton, Bishop of Sardis. In the fourth century, St. Epiphanius of Cyprus refers to the “Falling Asleep” of the Mother of God. In the fifth century, St. Juvenal, Patriarch of Jerusalem, told Byzantine Empress Pulcheria: “Although there is no account of the circumstances of Her death in Holy Scripture, we know about them from the most ancient and credible Tradition.” This tradition was gathered and expounded in the Church History of Nicephorus Callistus during the fourteenth century. At the time of Her blessed Falling Asleep, the Most Holy Virgin Mary was again at Jerusalem. Her fame as the Mother of God had already spread and had aroused many of the envious and the spiteful against Her. They wanted to make attempts on Her life; but God preserved Her from enemies. Day and night She spent her time in prayer. The Most Holy Theotokos went often to the Holy Sepulcher of the Lord, and offered up fervent prayer. More than once, enemies of the Savior sought to hinder Her from visiting this holy place, and they asked the High Priest for a guard to watch over the Grave of the Lord. The Holy Virgin continued to pray right in front of them, yet unseen by anyone. In one such visit to Golgotha, the Archangel Gabriel appeared to Her and announced Her approaching departure from this life to eternal life. In pledge of this, the Archangel gave Her a palm branch. With these heavenly tidings the Mother of God returned to Bethlehem with the three girls attending Her (Sepphora, Abigail, and Jael). She summoned Righteous Joseph of Arimathea and the other disciples of the Lord, and told them of Her impending Repose. The Most Holy Virgin also prayed that the Lord would have the Apostle John come to Her. The Holy Spirit transported him from Ephesus, setting him in that very place where the Mother of God lay. After the prayer, the Most Holy Virgin offered incense, and John heard a voice from Heaven, closing Her prayer with the word “Amen.” The Mother of God took it that the voice meant the speedy arrival of the Apostles and the Disciples and the holy Bodiless Powers. The faithful, whose number by then was impossible to count, gathered together, wrote St. John of Damascus, like clouds and eagles, to listen to the Mother of God. Seeing one another, the Disciples rejoiced, but in their confusion they asked each other why the Lord had gathered them together in one place. St. John the Theologian, greeting them with tears of joy, said that the time of the Virgin’s repose was at hand. Going in to the Mother of God, they beheld Her lying upon the bed, and filled with spiritual joy. The Disciples greeted Her, and they told her how they had been carried miraculously from their places of preaching. The Most Holy Virgin Mary glorified God, because He had heard Her prayer and fulfilled Her heart’s desire, and She began speaking about Her imminent end. During this conversation the Apostle Paul also appeared in a miraculous manner together with his disciples Dionysius the Areopagite, St. Hierotheus, St.Timothy and others of the Seventy Apostles. The Holy Spirit had gathered them all together so that they might be granted the blessing of the All-Pure Virgin Mary, and more fittingly to see to the burial of the Mother of the Lord. She called each of them to Herself by name, She blessed them and extolled them for their faith and the hardships they endured in preaching the Gospel of Christ. To each She wished eternal bliss, and prayed with them for the peace and welfare of the whole world. Then came the third hour (9 A.M.), when the Dormition of the Mother of God was to occur. A number of candles were burning. The holy Disciples surrounded her beautifully adorned bed, offering praise to God. She prayed in anticipation of Her demise and of the arrival of Her longed-for Son and Lord. Suddenly, the inexpressible Light of Divine Glory shone forth, before which the blazing candles paled in comparison. All who saw it were frightened. Descending from Heaven was Christ, the King of Glory, surrounded by hosts of Angels and Archangels and other Heavenly Powers, together with the souls of the Forefathers and the Prophets, who had prophesied in ages past concerning the Most Holy Virgin Mary. Seeing Her Son, the Mother of God exclaimed: “My soul doth magnify the Lord, and my spirit hath rejoiced in God My Savior, for He hath regarded the low estate of His Handmaiden” (Luke 1:46-48) and rose from Her bed to meet the Lord, She bowed down to Him, and the Lord bid Her enter into Life Eternal. Without any bodily suffering, as though in a happy sleep, the Most Holy Virgin Mary gave Her soul into the hands of Her Son and God. A joyous angelic song then began. Accompanying the pure soul of the God-betrothed and with reverent awe for the Queen of Heaven, the angels exclaimed: “Hail, Full of Grace, the Lord is with Thee, blessed art Thou among women! For lo, the Queen, God’s Maiden comes, lift up the gates, and with the Ever-Existing One, take up the Mother of Light; for through Her salvation has come to all the human race. It is impossible to gaze upon Her, and it is impossible to render Her due honor” (Stikherion on “Lord, I Have Cried”). The Heavenly gates were raised, and meeting the soul of the Most Holy Mother of God, the Cherubim and the Seraphim glorified Her with joy. The face of the Mother of God was radiant with the glory of Divine virginity, and from Her body there came a sweet fragrance. Miraculous was the life of the All-Pure Virgin, and wondrous was Her Repose, as the Holy Church sings: “In Thee, O Queen, the God of all hath given thee as thy portion the things that are above nature. Just as in the Birth-Giving He did preserve Thine virginity, so also in the grave He did preserve Thy body from decay” (Canon 1, Ode 6, Troparion 1). Kissing the all-pure body with reverence and in awe, the Disciples in turn were blessed by it and filled with grace and spiritual joy. Through the great glorification of the Most Holy Theotokos, the almighty power of God healed the sick, who with faith and love touched the holy bed. Bewailing their separation from the Mother of God, the Apostles prepared to bury Her all-pure body. The holy Apostles Peter, Paul, James and others of the Twelve Apostles carried the funeral bier upon their shoulders, and upon it lay the body of the Ever-Virgin Mary. St. John the Theologian went at the head with the resplendent palm-branch from Paradise. The other saints and a multitude of the faithful accompanied the funeral bier with candles and censers, singing sacred songs. This solemn procession went from Sion through Jerusalem to the Garden of Gethsemane. With the start of the procession there suddenly appeared over the all-pure body of the Mother of God and all those accompanying Her a resplendent circular cloud, like a crown. There was heard the singing of the Heavenly Powers, glorifying the Mother of God, which echoed that of the worldly voices. This circle of Heavenly singers and radiance accompanied the procession to the very place of burial. Unbelieving inhabitants of Jerusalem, taken aback by the extraordinarily grand funeral procession and vexed at the honor accorded the Mother of Jesus, complained of this to the High Priest and scribes. Burning with envy and vengefulness toward everything that reminded them of Christ, they sent their own servants to disrupt the procession and to set the body of the Mother of God afire. An angry crowd and soldiers set off against the Christians, but the circular cloud accompanying the procession descended and surrounded them like a wall. The pursuers heard the footsteps and the singing, but could not see any of those accompanying the procession. Indeed, many of them were struck blind. The Jewish priest Athonios, out of spite and hatred for the Mother of Jesus of Nazareth, wanted to topple the funeral bier on which lay the body of the Most Holy Virgin Mary, but an angel of God invisibly cut off his hands, which had touched the bier. Seeing such a wonder, Athonios repented and with faith confessed the majesty of the Mother of God. He received healing and joined the crowd accompanying the body of the Mother of God, and he became a zealous follower of Christ. When the procession reached the Garden of Gethsemane, amidst the weeping and the wailing began the last kiss to the all-pure body. Only towards evening were the Apostles able to place it in the tomb and seal the entrance to the cave with a large stone. For three days they did not depart from the place of burial, praying and chanting Psalms. Through the wise providence of God, the Apostle Thomas was not present at the burial of the Mother of God. Arriving late on the third day at Gethsemane, he lay down at the tomb and with bitter tears asked that he might be permitted to look once more upon the Mother of God and bid her farewell. The Apostles out of heartfelt pity for him decided to open the grave and give him the comfort of venerating the holy relics of the Ever-Virgin Mary. Having opened the grave, they found in it only the grave wrappings and were thus convinced of the bodily ascent of the Most Holy Virgin Mary to Heaven. On the evening of the same day, when the Apostles had gathered at a house to strengthen themselves with food, the Mother of God appeared to them and said: “Rejoice! I am with you all the days of your lives.” This so gladdened the Apostles and everyone with them, that they took a portion of the bread, set aside at the meal in memory of the Savior (“the Lord’s Portion”), and they exclaimed : “Most Holy Theotokos, save us”. (This marks the beginning of the rite of offering up the “Panagia” (“All-Holy”), a portion of bread in honor of the Mother of God, which is done at monasteries to the present day). The sash of the Mother of God, and Her holy garb, preserved with reverence and distributed over the face of the earth in pieces, have worked miracles both in the past and at present. Her numerous icons pour forth signs and healings, and Her holy body, taken up to Heaven, bears witness to our own future life there. Her body was not left to the vicissitudes of the transitory world, but was incomparably exalted by its glorious ascent to Heaven. The Feast of the Dormition of the Most Holy Theotokos is celebrated with special solemnity at Gethsemane, the place of Her burial. Nowhere else is there such sorrow of heart at the separation from the Mother of God, and nowhere else such joy, because of Her intercession for the world. The holy city of Jerusalem is separated from the Mount of Olives by the valley of Kedron on Josaphat. At the foot of the Mount of Olives is the Garden of Gethsemane, where olive trees bear fruit even now. The holy Ancestor-of-God Joachim had himself reposed at 80 years of age, several years after the Entry of the Most Holy Theotokos into the Temple. St. Anna, having been left a widow, moved from Nazareth to Jerusalem, and lived near the Temple. At Jerusalem she bought two pieces of property: the first at the gates of Gethsemane, and the second in the valley of Josaphat. At the second locale she built a tomb for the members of her family, and where she herself was buried with Joachim. It was there in the Garden of Gethsemane that the Savior often prayed with His disciples. The most-pure body of the Mother of God was buried in the family tomb. Christians honored the sepulcher of the Mother of God, and they built a church on this spot. Within the church was preserved the precious funeral cloth, which covered Her all-pure and fragrant body. In the fifth century, Patriarch Juvenal of Jerusalem testified before Emperor Marcian as to the authenticity of the tradition about the miraculous ascent of the Mother of God to Heaven, and he sent to Empress Pulcheria the grave wrappings of the Mother of God from Her tomb. Pulcheria then placed these grave-wrappings within the Blachernae church. Accounts have been preserved, that at the end of the seventh century a church had been built atop the underground Church of the Dormition of the Most Holy Theotokos, and that from its high bell-tower could be seen the dome of the Church of the Resurrection of the Lord. Traces of this church are no longer to be seen. In the ninth century near the subterranean Gethsemane Church a monastery was built, in which more than 30 monks struggled. In 1009, great destruction was done to the Church by the despoiler of the holy places, Hakim. Radical changes, the traces of which remain at present, also took place under the crusaders in 1130. During the eleventh to twelfth centuries the piece of excavated stone, at which the Savior had prayed on the night of His betrayal disappeared from Jerusalem. This piece of stone had been in the Gethsemane basilica from the sixth century. But in spite of the destruction and the changes, the overall original cruciform (cross-shaped) plan of the church has been preserved. At the entrance to the church along the sides of the iron gates stand four marble columns. To enter the church, it is necessary to go down a stairway of 48 steps. At the 23rd step on the right side is a chapel in honor of the holy Ancestors-of-God Joachim and Anna together with their graves, and on the left side opposite, the chapel of St. Joseph the Betrothed with his grave. The right chapel belongs to the Orthodox Church, and the left to the Armenian Church (since 1814). [1 arshin = 28 inches]. At an earlier time the church also had windows beside the doors. The whole temple was adorned with a multitude of lampadas and offerings. Two small entrances lead into the burial-chamber of the Mother of God. One enters through the western doors, and exits at the northern doors. The burial-chamber of the All-Pure Virgin Mary is veiled with precious curtains. The burial place was hewn out of stone in the manner of the ancient Jewish graves and is very similar to the Sepulcher of the Lord. Beyond the burial-chamber is the altar of the church, in which Divine Liturgy is celebrated each day in the Greek language. The olive woods on the eastern and northern sides of the temple were acquired from the Turks by the Orthodox during the seventh and eighth centuries. The Catholics acquired the olive woods on the east and south sides in 1803, and the Armenians on the west side in 1821. On August 12, at Little Gethsemane, at the second hour of the night, the head of the Gethsemane church celebrates Divine Liturgy. At the end of Liturgy, at the fourth hour of the morning, he serves a short Molieben before the resplendent burial shroud, lifts it in his hands and solemnly carries it beyond the church to Gethsemane proper where the holy sepulcher of the Mother of God is located. All the members of the Russian Spiritual Mission in Jerusalem, with the head of the Mission presiding, participate each year in the procession (called the “Litania”) with the holy burial shroud of the Mother of God.. The rite of the Burial of the Mother of God at Gethsemane begins customarily on the morning of August 14. A multitude of people with hierarchs and clergy at the head set off from the Jerusalem Patriarchate (nearby the Church of the Resurrection of Christ) in sorrowful procession. Along the narrow alley-ways of the Holy City the funeral procession makes its way to Gethsemane. Toward the front of the procession an icon of the Dormition of the Most Holy Theotokos is carried. Along the way, pilgrims meet the icon, kissing the image of the All-Pure Virgin Mary and lift children of various ages to the icon. After the clergy, in two rows walk the black-robed monks and nuns of the Holy City: Greeks, Romanians, Arabs, Russians. The procession, going along for about two hours, concludes with Lamentations at the Gethsemane church. In front the altar, beyond the burial chamber of the Mother of God, is a raised-up spot, upon which rests the burial shroud of the Most Holy Mother of God among fragrant flowers and myrtle, with precious coverings. Numerous pilgrims, having kissed the icon of the Dormition of the Most Holy Theotokos, following an ancient custom, then stoop down and go beneath it. On the day of the Leave-taking of the feast (August 23), another solemn procession is made. On the return path, the holy burial shroud is carried by clergy led by the Archimandrite of Gethsemane. Today flowers are blessed in church, and people keep them in their homes. During times of family strife or illness, the flower petals are placed in the censer with the incense, and the whole house is censed.